Learning: 25 Learning Techniques for Accelerated Learning – Learn Faster by 300%! Achieve Lightning-Fast Learning Speeds and Reach Your Dreams Faster! Is learning a drag? Does studying make you anxious and frustrated? Do you ever wish you could just pick things up faster? No matter how hard you study, the truth is, you won’t realize your potential without the right methods. Discover how to use the journey memory method, even building a memory palace, how to quickly memorize vocabulary in any language, how to deconstruct a skill and identify the most important parts to focus on, how to sequence, use mind maps and NLP modeling, and how to adopt the mindset of learning champions. Order Now to start learning 300% faster and stop wasting your time, money, and energy on the slow, inefficient, outdated learning methods. 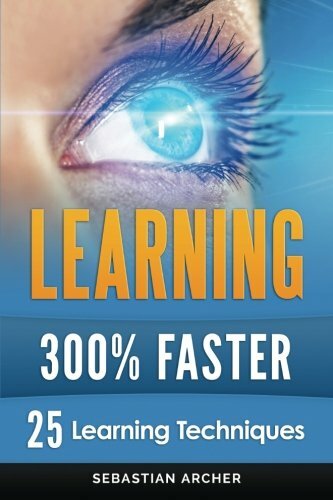 Get it right — TODAY— with Learning 300% Faster: 25 Learning Techniques of Accelerated Learning Masters.